6 feet 3.5mm Male to Male Stereo Audio Cable [AnV005434-2m] : Onchee.com - the accessory shop for all your handheld Electronics! 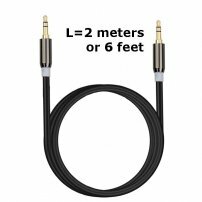 Enhance your audio options with this versatile 3.5mm male-to-male stereo audio cable. From iPhones to iPads, the cable quickly connects your smartphone, MP3 player, tablet, or other portable audio device with a 3.5mm audio jack (i.e. headphone jack) to the AUX-in port of your car stereo, portable speaker, or other compatible audio-output device. Custom Desktop Mount and Enclosure with Anti-Theft / Secure Lock & Keys for Apple iPad Pro 10.5"